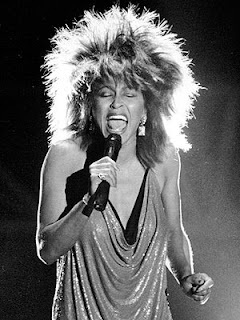 I am, however, off to see Tina Turner in concert tonight. And I am practically giddy with excitement. Private Dancer, River Deep Mountain High, We Don't Need Another Hero, What's Love Got To Do With It. I want them all. I was tempted to buy a massive wig, put an obscenely short dress on and walk around like I've done a massive poo at the concert as a tribute to her. But then realised that noone wants to see me in a short dress. Or doing a poo for that matter. Especially the latter. Tina I heart you, you mad old bird.